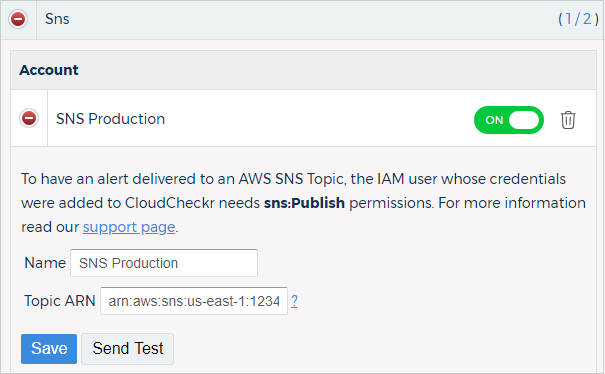 The integration with Amazon Simple Notification System (SNS) allows you to configure SNS notifications that you can receive daily or any time there is a change to a Best Practice Check or alert. To learn how to configure your integration with SNS, review the procedure. From the drop-down menu, select Sns. Type the name of your SNS topic. An SNS message indicates that your configuration was successful. Here are some examples of message formats and content to help you parse the messages. This is the entire message a user would receive from AWS. Inside of this is the Message attribute, which is what CloudCheckr includes in its notification. This is the content from the Message attribute formatted by CloudCheckr for legibility.